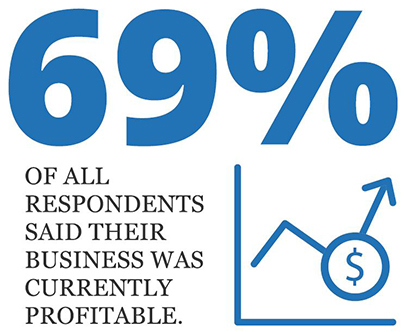 We’ve taken a comprehensive look at the results of our State of Small Business survey in order to gain insight into trends and statistics among African-American small business owners. Read on to learn more about African-American small business owners, what their businesses, challenges, and motivations are, and how these differ from the nationwide average. This year saw an increase in the confidence that African-American business owners have in the state of small business given the current political climate. 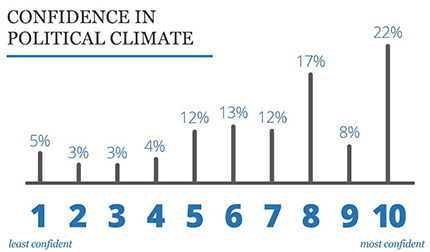 There was a nine percent increase of respondents answering nine or 10 on a 1 to 10 rating scale (10 being the most confident), to 28 percent from last year’s 26 percent. Despite this growth, African-American small business owners are less confident than the average small business owner about the state of small business in this political climate, with 27 percent of African-Americans rating a five or under on the scale, compared to only 24 percent of average business owners. Though more hesitant about the state of small business in today’s political climate, African-American small business owners are happier than the average small business owner. 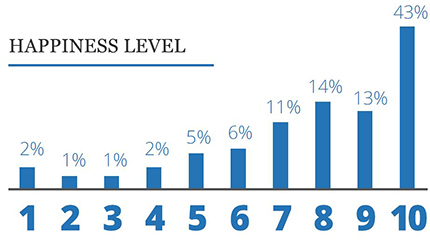 Fifty-six percent of African-American small business owners rated their happiness at nine or 10 on the rating scale (10 being the happiest), two percent more than the average small business owner. A desire to “pursue my own passion” was the primary reason African-American respondents went into small business for themselves (28 percent), followed closely by “ready to be my own boss” (27 percent). 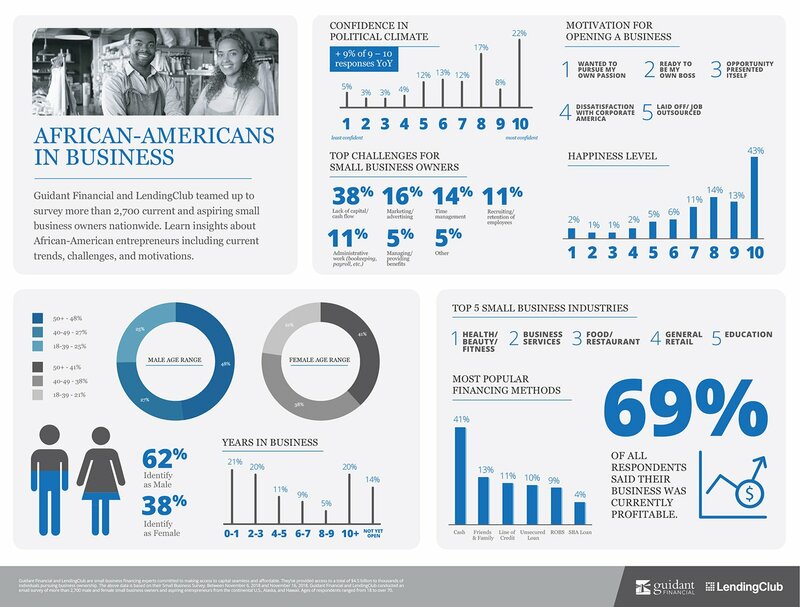 Other top reasons to go into small business for African-Americans included “opportunity presented itself” (17 percent) and “dissatisfaction with corporate America” (11 percent). African-Americans don’t wait as long to jump on the opportunity of opening their own small business compared to the average small business owner. While a plurality of African-American small business owners are baby boomers (45 percent), the national average of boomer small business owners is a majority, at 57 percent. African-American business owners age 40 to 49 overtake the average at 32 percent versus 25 percent. Finally, there are slightly more millennial African-American small businesses owners than the average, with 23 percent of African-American respondents in this generation versus the 18 percent of average small business owners. There are more female African-American small business owners than the average by a solid 15 percentage points. Thirty-eight percent of African-American small business owners are women — a big distinction from the average small business owner, of whom only 23 percent are women. This percentage hasn’t changed since last year, suggesting that though the number of African-American women in small business is greater than the average, it has hit the same plateau of growth seen in the average small business owner populace. Lack of capital and cash flow is the biggest challenge for African-American small business owners, though it’s a challenge indicative of larger difficulties. This lack of cash is a bigger challenge for African-American business owners than the average business owner, at 38 percent to 33 percent respectively. Fewer African-American small businesses are approved for financing, often at lower amounts of money with higher interest rates. Those African-American small businesses owners that do obtain financing have less of it to acquire businesses — reflected by the 58 percent of African-American small businesses acquired at under $50,000, compared to the 45 percent of average businesses that were acquired for under $50,000. The wealth gap also contributes to financing challenges for African-American business owners, making it harder to achieve financing. A lack of capital and cash flow helps explain the nine percentage point gulf of profitability between African-American small businesses and the average small business (at 69 percent versus the 78 percent average). Without the funds to invest in as many resources as other businesses, such as hiring talent or marketing and advertising, competing for contracts or attracting clients becomes exponentially more difficult. Forty-seven percent of African-American small business owners are running their businesses by themselves, compared to the 33 percent of average small business owners. African-American businesses have fewer employees, with 38 percent having two to five employees and only seven percent having six to 10 employees. Contrasting this is the average small business owner, with 41 percent employing two to five employees, and 12 percent employing six to 10 workers. Likely in part because of these financing challenges, more African-American small business owners use cash to fund their businesses than the average small business owner. Forty-one percent of African-Americans leverage cash versus 32 percent of average small business owners. 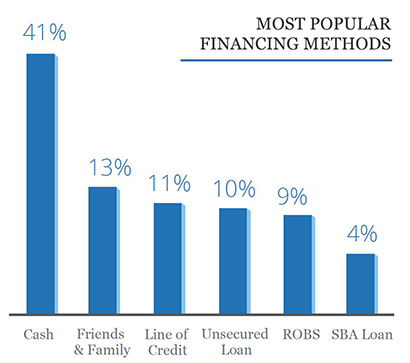 Help from friends and family is the next most popular financing method but with a drastic drop, at only 13 percent. Alternative forms of funding, such as Rollovers for Business Start-ups (ROBS), a form of financing that allows small businesses owners to tap into eligible retirement accounts to fund their businesses without tax penalties, grew by 21 percent in popularity among African-American small businesses year over year. Other forms of financing that increased in popularity from year to year included unsecured loans, lines of credit, and SBA loans. Meanwhile, equipment leasing and crowdfunding both saw decreases in use — currently, only three percent of African-American small business owners use equipment leasing, and only one percent utilize crowdfunding. With a 45 percent increase in industry share, African-American small business owners are opening more health, beauty, and fitness businesses than in the prior year. Health, beauty, and fitness overtook last year’s most popular industry, business services, as the most popular industry for African-American small businesses this year. The African-American community strives relentlessly not just to overcome challenges but change the systems that sustain these problems and support aspiring entrepreneurs and small business owners. Supporting African-American (or any other minority-owned) businesses assists the entire economy. For example, minority-owned businesses are more likely to hire minority workers, some of those most affected by unemployment. From 2012 to 2017, minority-owned small businesses grew by 79 percent. From 1997 to 2015, the number of businesses owned by African-American women grew an amazing 322 percent (making them the largest growing group of entrepreneurs at that time). Despite the challenges they face, it’s clear that African-American small business owners are becoming more and more populous and using the entrepreneurial journey to empower their community.